Imagine a place where a Ferrari is as common as Corolla. A place where a Bentley Continental GT will be towed away simply for being too average to take prime parking outside the hippest clubs and Casinos. A place where the waiter's Rolex is actually real, and poverty means having to drive a Mercedes. Welcome to Monaco––playground for only the seriously wealthy; a surreal place along the French Riviera, where even royalty need to make a reservation. Officially, I was the poorest person in the principality, yet for about one full hour, everyone wanted to be me. They call it the Carver One. A three wheeled stroke of genius by Dutch inventor, Anton van den Brink. It's a mechanically engineered substitute for Prozac, and just short of a Kardashian jelly wrestling match, nothing could pull in quite as many looks along these moneyed streets. People were coming out of stupidly expensive coffee shops, motioning the pesky Ferraris and Lamborghinis in front of me to move out of their view so they could snap a picture. Thumbs up. Big smiles. This is a very emotional vehicle. The carver doesn't simply bring you from A to B; it brings happiness––to you and everyone else that wants to be you. I've never tried anything quite like it. 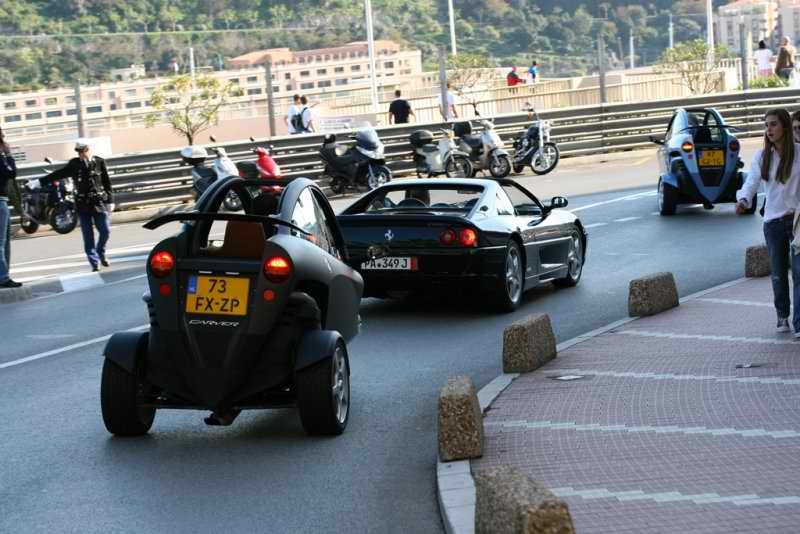 I mean, why drive around Monaco when you can surf through it. All of a sudden, four wheels just seem so pedestrian. I found myself slowing down before corners, sandbagging, creating enough space between me and the guy in front so I could attack the curve and exploit that unique banking feeling and literally carve my way through the narrow streets. It is radical, yet natural at the same time; a disconcerting thought, but a surprisingly reassuring sensation. It's the way God intended people to turn. An aeronautical engineer by trade, Van den Brink says that banking is the only natural way to take corners, by bringing the centre of gravity towards the centre of the curve to ensure stability. He should know what he's talking about; after all, his entire fortune is banking on the fact. Since first coming up with the idea in the early nineties, while stuck in an horrendous Parisian traffic jam, his company has now expanded to include dealers in Belgium, Luxembourg, France, Germany, Norway, Sweden and USA. After almost a decade of engineering and development, the Carver One received full European type approval in 2002. 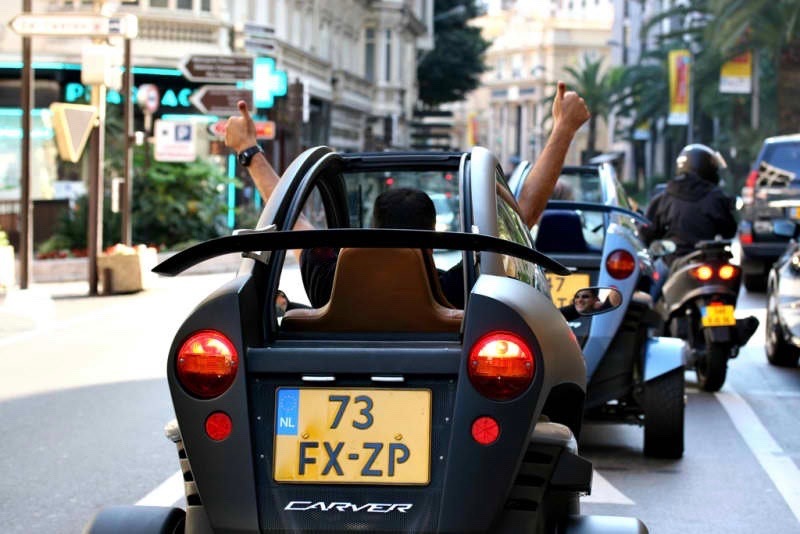 The first hand-made vehicles were produced in 2003 and sold out to enthusiasts worldwide. 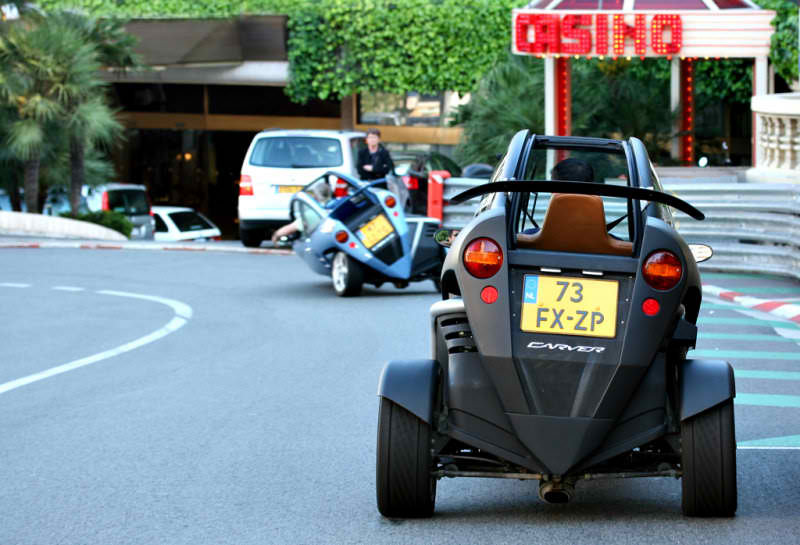 Prices vary, of course, but a fully kitted out version will set you back a staggering 37,000 Euros. There's absolutely nothing stopping you from ordering one directly from Europe and having it shipped anywhere. At least you don't have to worry about left or right hand drive availability. Its difficult to pigeon hole this vehicle; basically, the Carver One is steered like a car, but during cornering it banks like a motorcycle. Or an aeroplane. At first I thought I was going to tip over and destroy any envy I had built up for myself, but the mechanical-hydraulic Dynamic Vehicle Control (DVC™) system automatically adjusts the tilt angle, ensuring an optimum balance at all times, free from driver participation, resulting in an agile but safe, stable and comfortable platform. Contrary to what you might think, the angle of banking is not determined by the amount of steering input or sharpness of corner, but rather the amount of steering torque. In other words, if you jerk the wheel quickly, you will achieve maximum banking, whereas if you turn the wheel slowly, even until full lock, you won't induce the tilting mechanism fully. After getting the hang of the tilting sensation, I punched the throttle and the 68-hp turbocharged four-cylinder 660cc, 16 valve, five-speed rear-mounted engine pounced me from 0 to 100 km/h in just over 8 seconds. May not mean much from where you're sitting, but when you're driving in a place that Williams F1 driver, Mark Webber, described as like trying to ride a mountain bike in your living room... well, put it this way, they assured me that the stain would come out with a little soda water. Although I was left to take there word for it, the Carver One is meant to top out at a frightful 185 kph. My test route only allowed me to kiss a hundred here and there, but the feeling was exaggerated so the adrenaline evened things out. Fun as it was, I wouldn't want to hog the left lane of the autobahn in this thing though. 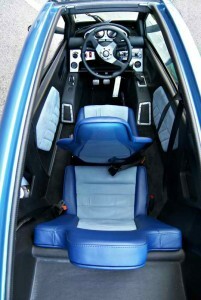 The shell, we've been assured, is made up from an extremely safe and enclosed ‘monocoque’ cockpit structure and seats the driver and passenger in a tandem configuration, with the passenger's seat behind the driver, similar to a kayak. 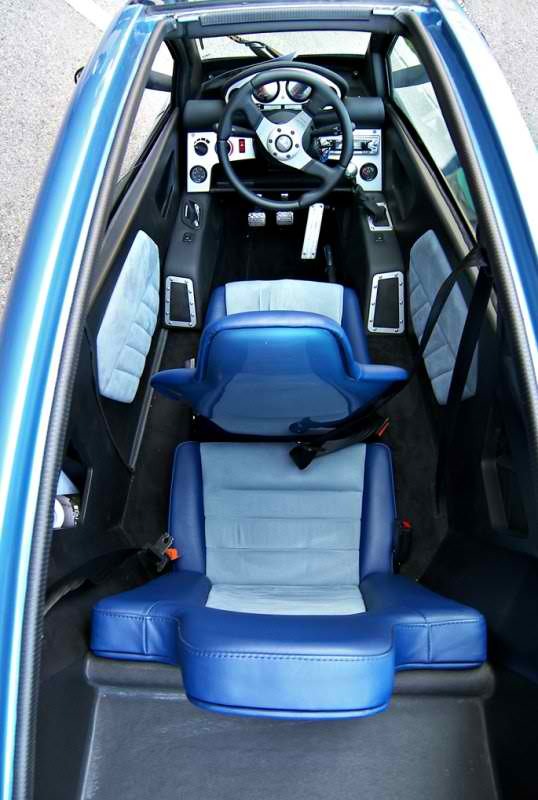 Inside, it is fitted out like a proper sports car, including sports seats with seat belts and a sports leather-covered steering wheel. A removable body-coloured roof panel, alloy wheels and design aluminium-look dashboard and gear knob are part of a comprehensive standard package. But being such a limited production run, each Carver One can be personalised through additional options such as metallic or special exterior colours, leather seats and engine tuning. In some ways you feel totally safe, yet there's still a certain measure of vulnerability that comes from the feeling of being enclosed in such a small, moving compartment. Oddly enough, a bike, despite being totally exposed, offers a greater perception of confidence that probably comes from knowing you're not trapped. 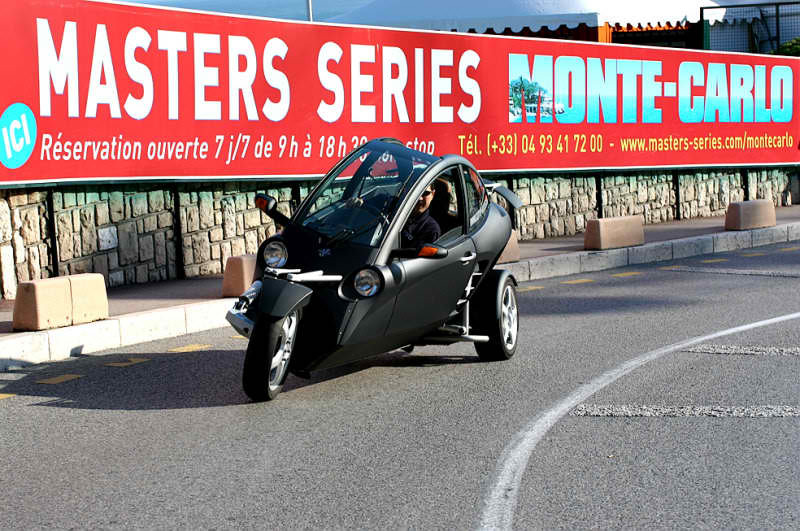 A false sense of security, perhaps, as Dutch crash tests rate the Carver One on par with a small car and safer than anything else on two wheels. I've been told its all a matter of getting used to it, and I'm inclined to believe them. They haven't let me down yet, I thought to myself as I went full lock and tilted heavily into the Grand Hotel Hairpin, the tightest, slowest corner on the famous F1 circuit, with one hand stretched out the window touching the road, which now felt like it was just inches away from my face. I carved my way through some of the most historic landmarks like the famous Montecarlo Casino, and left a trail of smiling faces behind me. It feels a bit like skiing – there's total involvement. 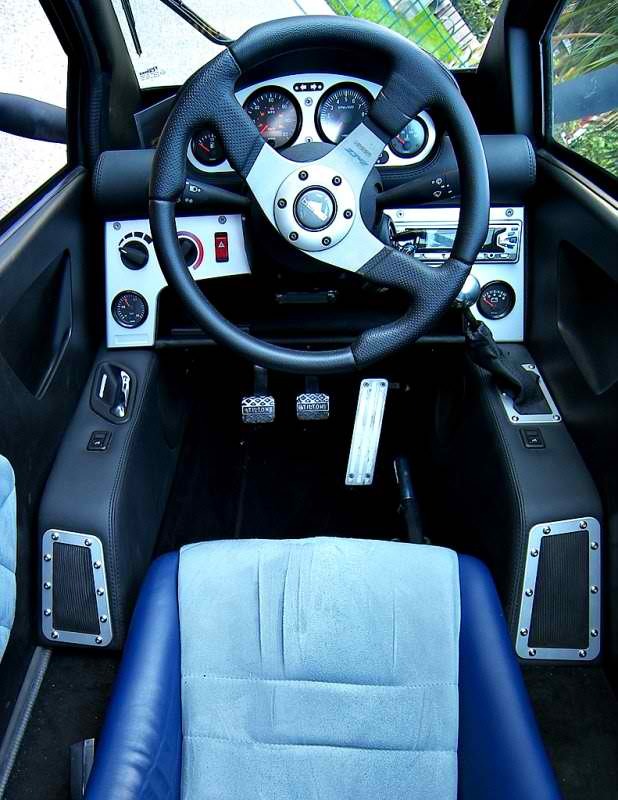 The driving aspect is second nature; you forget all about the clutch and gears and become obsessed with curves. Even a round about became exciting. I would find myself deliberately missing my exit, just so I could have another go. By this stage I realized that I hadn't stopped smiling yet. My face was starting to hurt. But I couldn't stop. Even while just sitting completely stationary at the traffic lights. It is one of those involuntary reactions, like after the first time you've ever driven a go kart. Or been with a girl. It is not overly powerful by any standard. It has a luggage compartment about as big as a super model's appetite and it looks a little awkward just standing upright. And it could use better brakes. Logically, it doesn't make a whole lot of sense, but ironically, it takes a curve to set things straight. Kind of like a smile. And when you're driving one of these, life is full of them. James Deakin is a multi-awarded automotive journalist located in Manila, Philippines. He has a weekly column in the Philippine STAR's motoring section, is a motoring corespondent for CNN Philippines and is the host of the Philippine motoring television show Drive, which airs every Sunday night at 10pm on CNN Philippines.